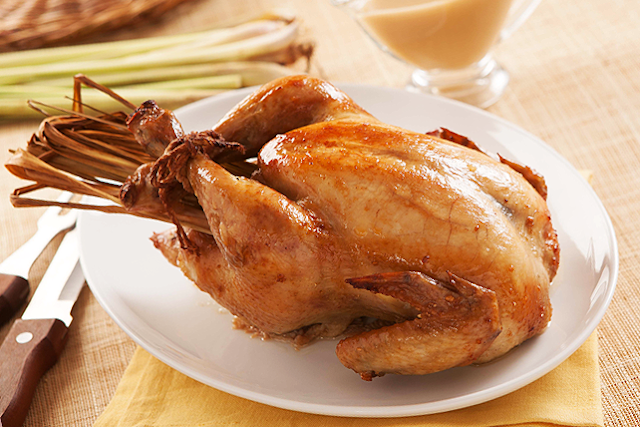 Try out this Asian-inspired tangy roast chicken recipe and let your family enjoy the mouth-watering fragrance as it roasts. Remember to thoroughly dry the chicken inside and out. Chill, uncovered, overnight in the refrigerator to completely dry the chicken before roasting. This will help the chicken become crispy and brown when you bake it. 2. In a bowl, combine MAGGI MAGIC SARAP®, MAGGI® MAGIC SINIGANG Original sa Sampalok MIx, and garlic. 3. Rub prepared chicken with the mixture. Make sure that chicken is rubbed all over, including the inside cavity. 4. Stuff lemon grass inside the chicken cavity. Tie legs using twine. 5. Roast chicken in a 375 °F preheated oven for 1 hour. After one hour, remove from the oven and baste with drippings. 6. Cover chicken with foil and rest for 20 minutes before cutting into serving pieces. 7. For the gravy, in a sauce pan, heat pan drippings. Add flour and cook for 3-5 minutes. 8. Pour in water and mix until smooth. Season with MAGGI MAGIC SARAP®, MAGGI® Savor Classic and sugar. 9. Simmer for 3 minutes. Add butter and mix into gravy for consistency.